Thrikkadavoor is a small town located on the banks of the Ashtamudi backwater in Kollam district. It is about 5 km from Kollam town. The Sree Mahadeva temple is an ancient temple situated in the village of Thrikkadavoor and is the most prominent of Shiva temples in the district. The annual ten-day festival of the temple is a splendid celebration attended by thousands of people. 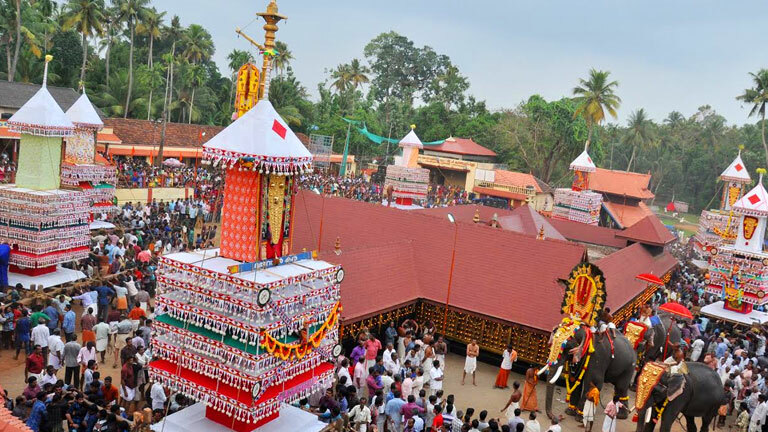 The highly devotional Thiruvathira festival and the resplendent kettukazha add to the charm of the festival. There is an interesting legend attributed to the origin of the temple, which is now administered by the Travancore Devaswom. Sage Mrikandu and his wife were saddened as they did not have a child. Once Lord Siva appeared before them and gave two options. One was to have a short-living intelligent boy and the other to have a long-living idiot. The couple selected the former and was blessed with a baby boy who would live for 16 years. They named him Markandeya. Young Markandeya was an ardent devotee of Lord Siva. At the age of 16, on his last day, he sat immersed in prayers in front of a Lord Siva idol. The divine mood deterred the messenger of Yamaraja (the God of death) from taking Markandeya's life. Later, Yamaraja took up the task and sprung the noose aiming the boy's neck. Unfortunately, the noose fell over the Sivalinga which angered Lord Siva. The furious god entered into a war with Yama which the former won. In the end of the battle, Lord Siva laid the condition to spare the life of his devout Markandeya for not killing Yamaraja. Mythology says that Thrikkadavoor was where this event occurred.